Could the Shutdown Finally Make Trump’s Base Abandon Him? It’s day 27 of the government shutdown, and a new NPR/PBS Newshour/Marist poll suggests that Trump’s base is losing faith. Over the last month, Trump’s approval rating has dropped to 39 percent overall, a trend driven by losses in demographics where he is typically strong. Forty-two percent of white suburban men say they approve of the president’s performance, down from 51 percent in December. White men without college degrees have always been more likely to support Trump, but the president’s approval rating declined by six points among this group. Even white Evangelicals, typically Trump’s most fervent supporters, are beginning to break away from him. 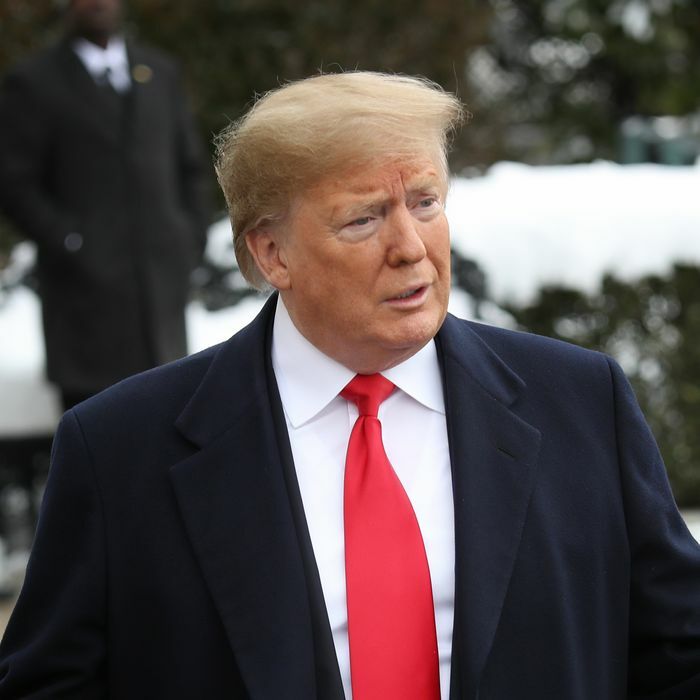 Seventy-three percent approved of Trump in December, but 66 percent said the same in January — and only 58 percent said they would “definitely” vote for him again in 2020. In 2016, recall, Trump won 81 percent of the white Evangelical vote. We do know, however, that little else about the first two years of Trump’s presidency has dismayed his base. The separation of migrant children from their parents, his border-wall obsession, revelations from the Mueller investigation — it was all fine, even better than fine, to his most dogged supporters. But the president ran on his business prowess. His anti-immigrant prejudice gilded promises of jobs and prosperity (at least, for a deserving few). White Evangelicals, for example, didn’t all support Trump because they prioritized ideological control of the U.S. Supreme Court. One 2016 poll from Lifeway Research, a Christian firm, established a demarcation between the views of white Evangelical clergy from those of their parishioners. While both groups backed Trump, clergy were much more likely to say that their votes were motivated by the prospect of conservative Supreme Court nominees. Non-clergy prioritized both the economy and national security over either the Supreme Court and abortion. Unemployment is currently low, but in other respects, the Trump presidency has been economically disastrous for workers. The government shutdown has now cost the average federal worker $5,000 in pay since it began, according to one analysis by the New York Times. Some federal workers and subcontractors are rationing insulin and crowdfunding their mortgages. The U.S. Coast Guard is serving without pay, too. And shutdowns don’t affect the federal workforce in isolation. The owners of one Wichita, Kansas, cafe told the HuffPost that many of their customers are federal workers, and the furlough has drastically reduced their clientele. The average Trump voter may disdain big government as an abstract enemy, but its absence bears consequences they may not have anticipated. As serious as the shutdown is, it probably isn’t the only factor shrinking Trump’s base. Instead, it may be more accurate to view his eroding support as evidence of a snowball effect — evidence that not even his most rabid followers can ignore the combined pain of a federal shutdown and a trade war. “I voted for him, and he’s the one who’s doing this,” one Trump supporter complained to the Times on January 7. “I thought he was going to do good things. He’s not hurting the people he needs to be hurting.” Coal jobs have not materialized. China’s retaliatory tariffs on U.S. agricultural goods have harmed farmers, and the administration’s promised farm aid hasn’t reached everyone in need. The Des Moines Register reported in November 2018 that “dozens” of Iowa farmers — mostly corn growers — received under $25 in tariff assistance. Many soybean farmers have been forced to let crops rot in the fields because of sharp drops in global demand. As Reuters reported last November, the administration’s farm aid program compensates farmers for acres harvested rather than acres planted, which prevented some from receiving any assistance. Maybe the shutdown helped convince Trump’s most committed followers of a fact many working poor already understood. Trump isn’t working for them — and he never intended to.